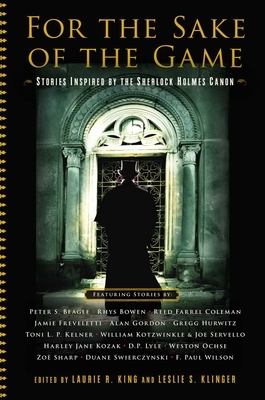 For the Sake of the Game is the latest volume in the award-winning series from New York Times bestselling editors Laurie R. King and Leslie S. Klinger, with stories of Sherlock Holmes, Dr. Watson, and friends in a variety of eras and forms. King and Klinger have a simple formula: ask some of the world's greatest writers--regardless of genre--to be inspired by the stories of Arthur Conan Doyle. Featuring Stories by: Peter S. Beagle, Rhys Bowen, Reed Farrel Coleman, Jamie Freveletti, Alan Gordon, Gregg Hurwitz, Toni L. P. Kelner, William Kotzwinkle and Joe Servello, Harley Jane Kozak, D. P. Lyle, Weston Ochse, Zoe Sharp, Duane Swierczynski, and F. Paul Wilson.